We are proud to report that Library and Archives Canada (LAC) has recently released a new data set on the Canadian Government Open Data portal as part of a First World War collaborative initiative with the Muninn Project. 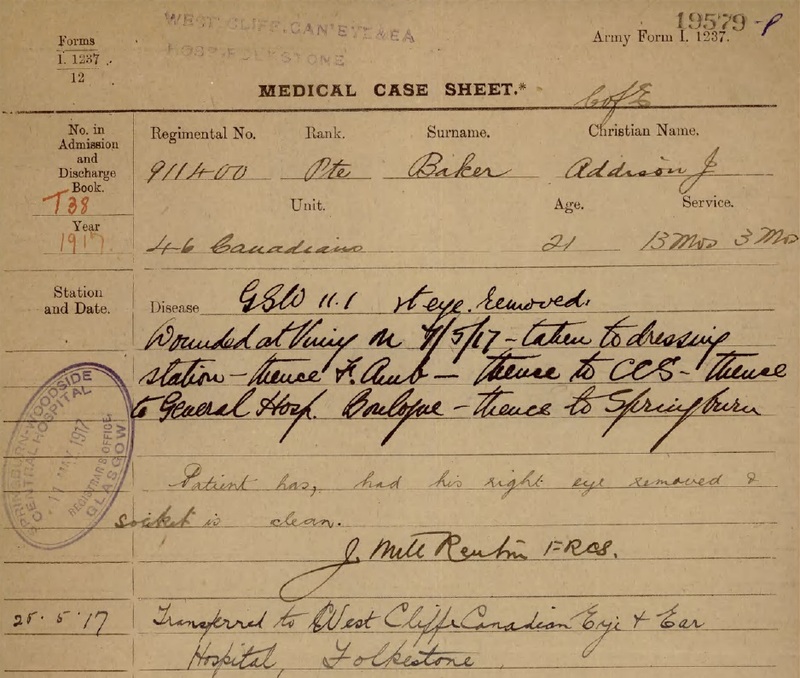 The project involved the partial transcription of the service records of soldiers who served in the Canadian Expeditionary Forces (CEF) during the First World War. LAC provided the digitized service files of 1,000 soldiers while the Munnin Project organized the crowdsourcing for the transcription and data linking of these historical documents. As a pilot project, the scope was limited to a specific medical form—the medical case sheet—which is found in most of the files and which contains information recorded by hospital staff on a specific soldier’s medical history. The information that has been gathered from the transcriptions represents a spectrum of the types of health issues one would expect to occur in a large group of men. Some of the medical cases are directly related to combat injuries such as gunshot or shell wounds or shell shock. Others are related to the living conditions found in trenches which would increase ailments affecting the respiratory system and the outbreak of diseases such as influenza. A large proportion of the recorded information is just the everyday health issues of the time: toothaches, measles, etc. To learn more about the information that was gathered from the service files, visit the First World War Linked Open Data project. The raw data is also available on the Canadian Open Data Portal in Linked Open Data and plain text format. This entry was posted in Digitization, Military Heritage, Our Collection and Facilities and tagged crowdsourcing, Linked open data, open data, open government by Library and Archives Canada Blog. Bookmark the permalink. Each month I look to see at how far into the alphabet your transcriptions for this project are. It is coming along nicely and I am looking forward to seeing my grandfather’s records when you hit the “P”s. Good work and thank you so much for doing it. This sounds like a really time-consuming project, and I appreciate all of the efforts being put into making handwritten information more accessible for research. I’m lucky enough to have found the military service records for my grandfather and great uncle already, since our family name comes at the beginning of the alphabet! I’m also grateful to know that 16 records out of the 1,000 mention venereal disease as one of the medical issues the servicemembers suffered from, because now my great uncle’s syphilis reported in his records doesn’t seem so awful.